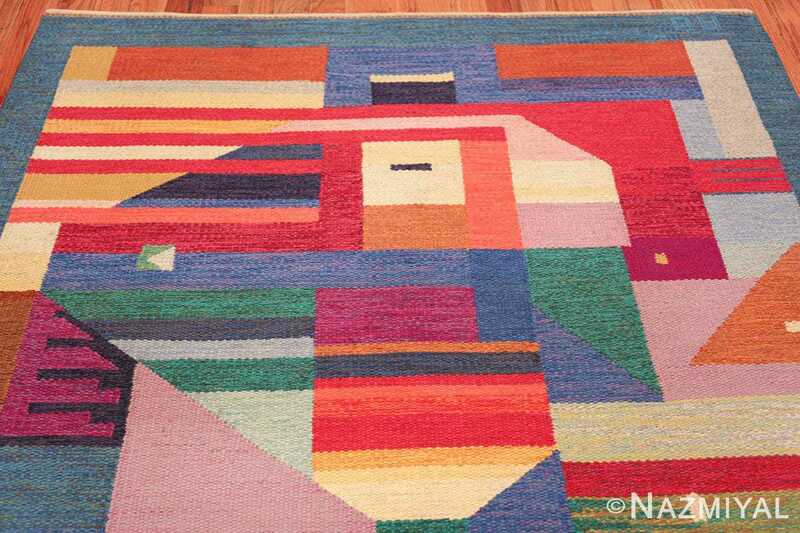 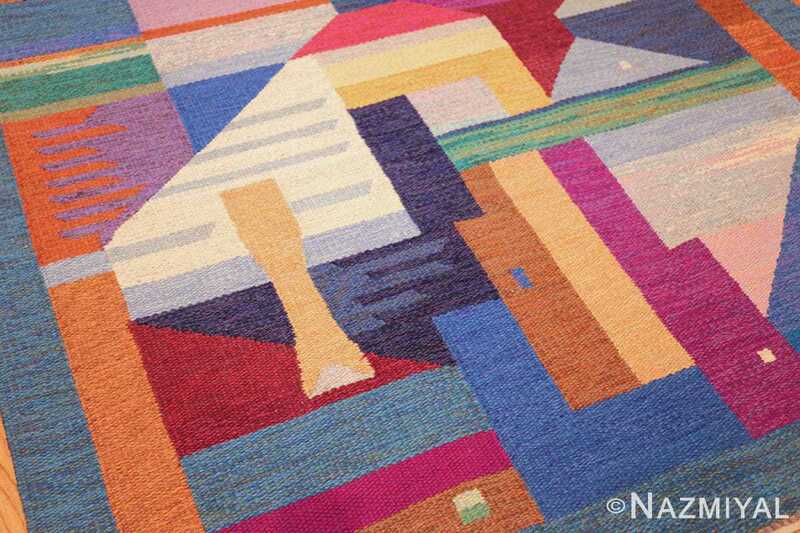 Magnificent and Colorful Vintage Scandinavian Agda Osterberg Kilim Rug, Country of Origin / Rug Type: Scandinavia Rug, Circa Date: Mid – 20th Century – This colorful vintage Scandinavian Agda Osterberg rug is a unique work of abstract beauty. This magnificent vintage kilim rug features an amalgam of geometric shapes along with its bold and diverse color array create a wondrous work of textile art with an allure that is rarely matched. 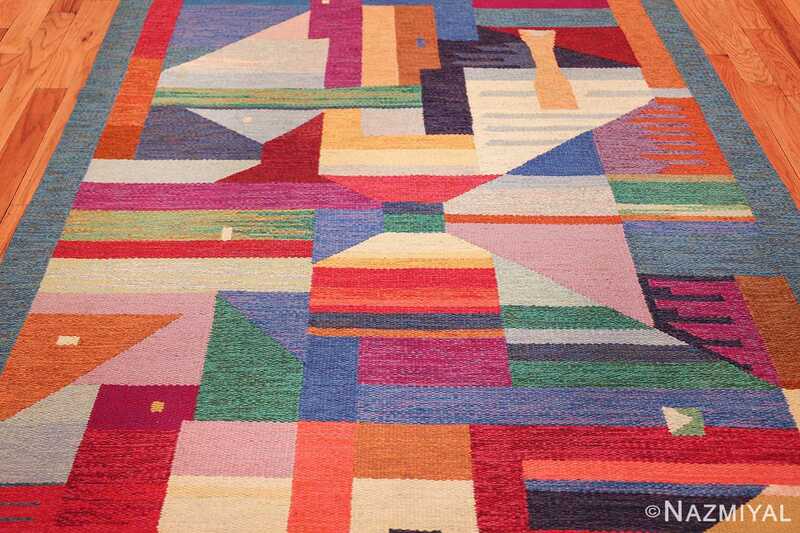 Despite the daring abstractness of the design of this vintage mid century carpet, there is more to the design than just geometric elements. 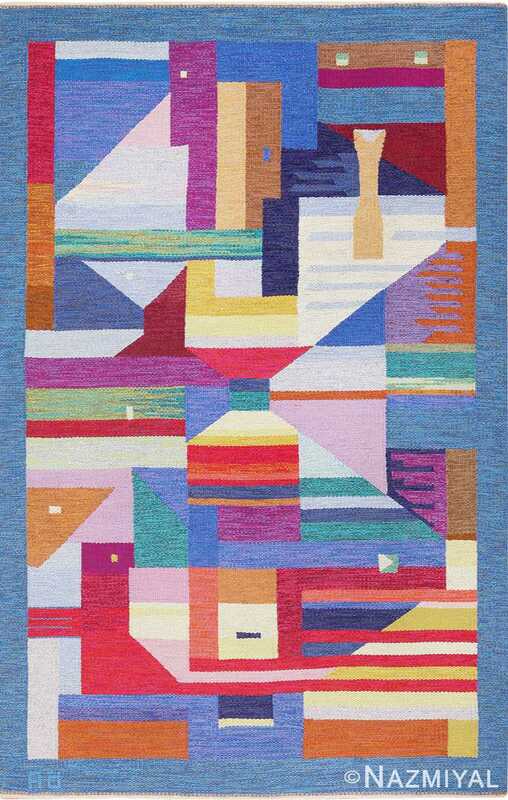 The more one spends time looking at this magnificent mid century Scandinavian rug, the more design elements start to come together to create a far more expressive piece. Despite its somewhat unorganized first impression, there is unity and symmetry. The longer the observer examines the details of the designs in this exciting Agda Osterberg kilim rug, the more symmetrical and unified the illustration becomes. 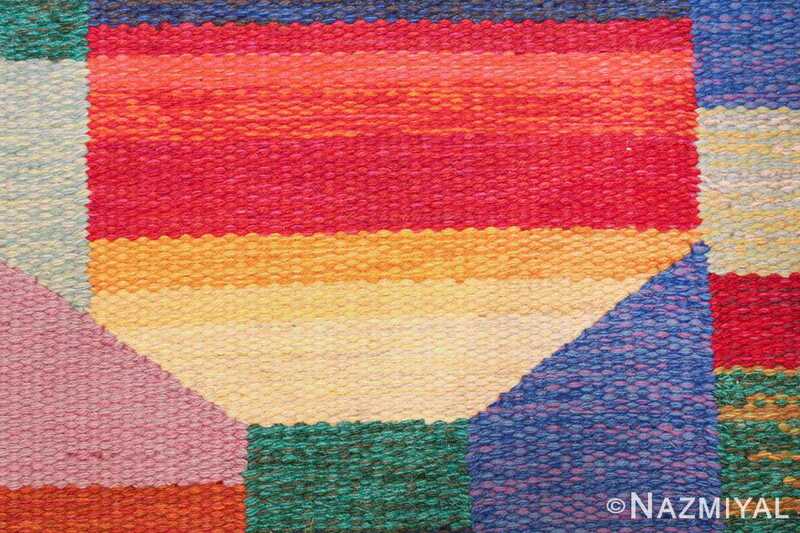 In addition, constructed purely out of geometric shapes and bold primary colors, we start to see patterns of birds and people’s faces. 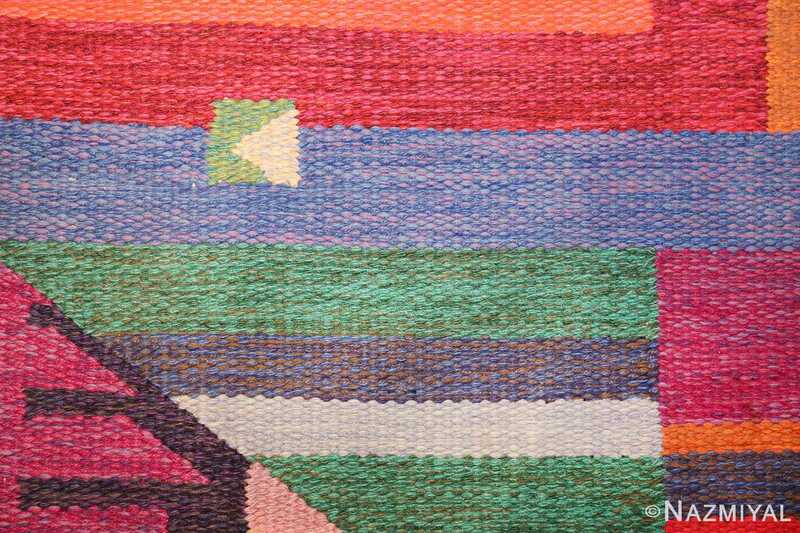 While we see a side view of the birds, some of the people are looking straight at us while the others are gazing sideways and peering off into the distance. 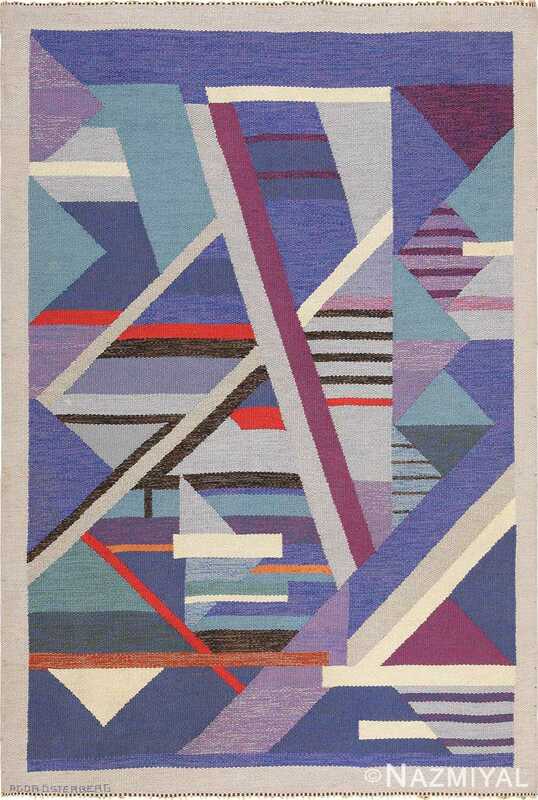 The somewhat haphazardness of the central design is peacefully tempered by the solid blue based colored border that is separated and untouched by any patterns or designs. 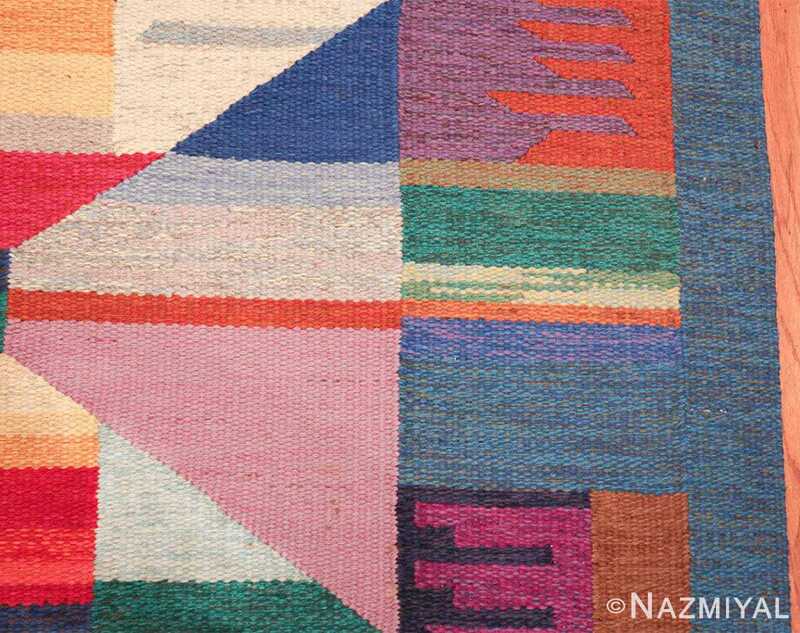 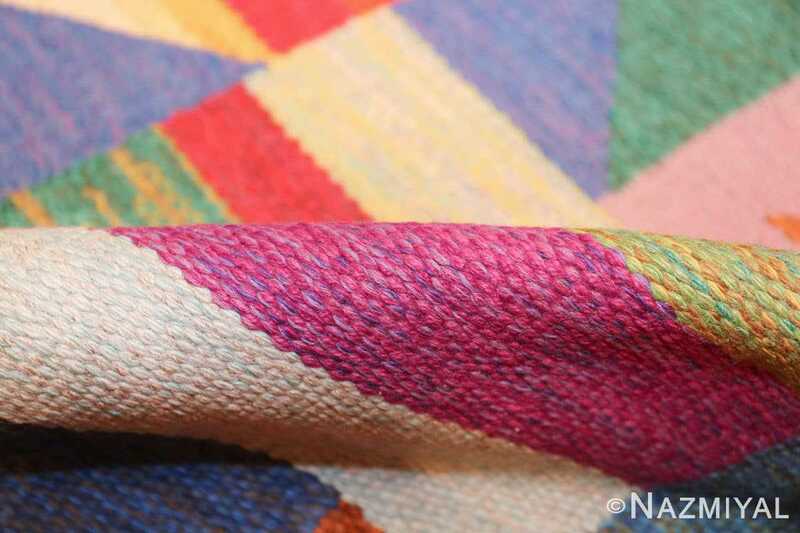 This solid frame that encircles that this Agda Osterberg kilim rug prepares the mind to enter the wild array of colors and patterns that characterize the central rectangle of the carpet. 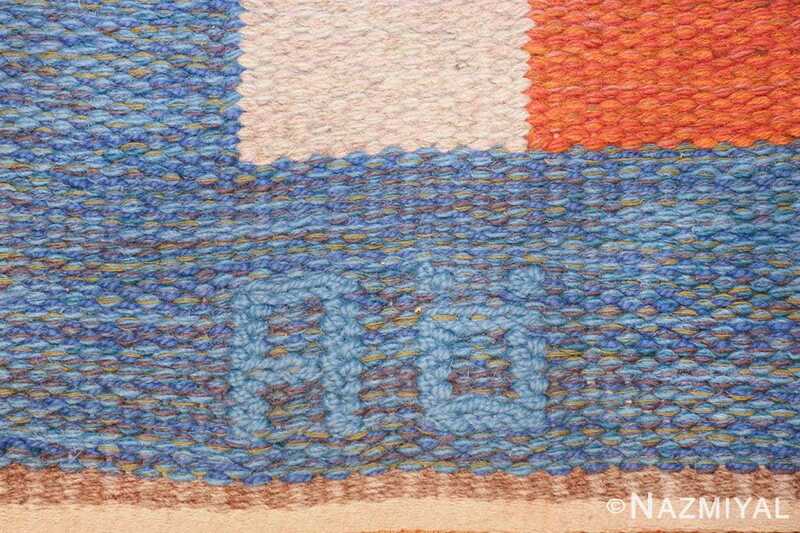 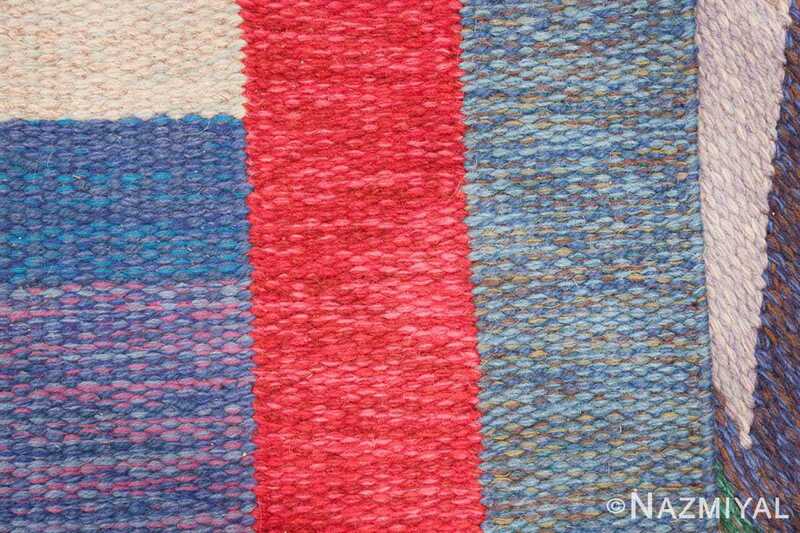 It also offers us a buffer between the end of the flat woven kilim rug and the beginning of the floor or wall where it has been placed. As if giving us a nice tranquil place to rest before moving on. 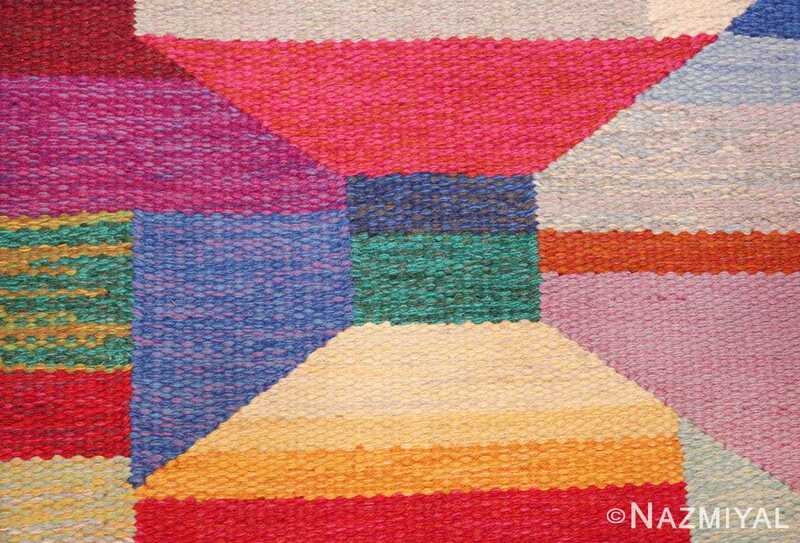 This wildly original piece of textile art is a rare and breathtaking example. It can be used a magnificent great decorative rug. 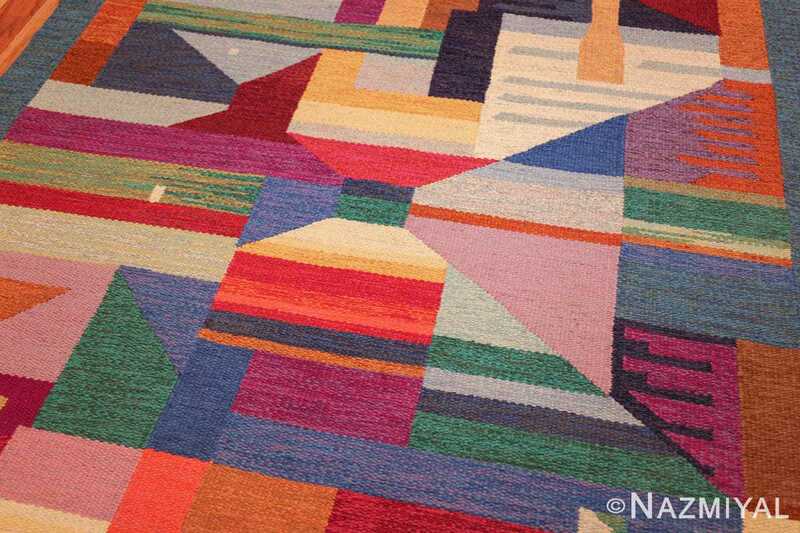 That said, it could be just as easily be used as a magnificent wall hanging tapestry rug. 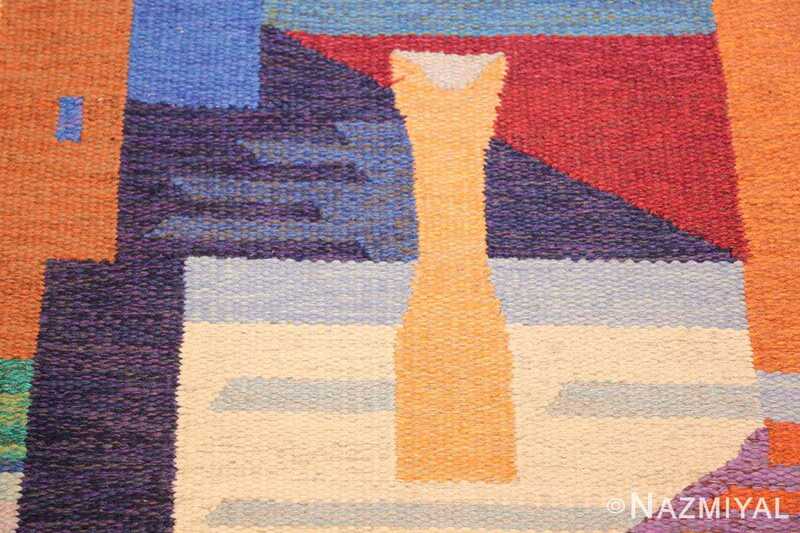 Regardless of how it is used, this Agda Osterberg kilim rug is one impressively exciting piece that will add an elusively charming quality to any room’s interior design. 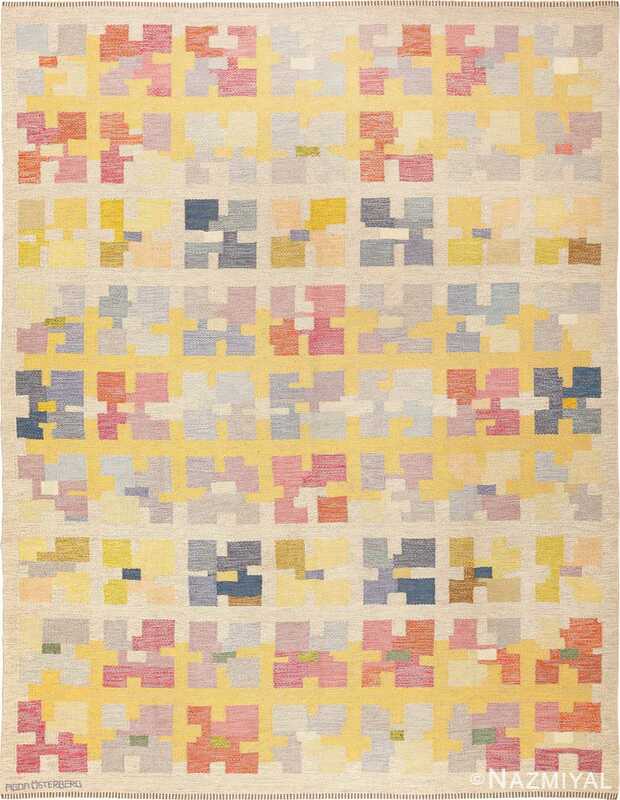 This dynamic mid-century modern Scandinavian runner delights with its abstract, geometric composition and its pallet of pastel spring colors.